This picture of the Malacca River Cruise was taken by photographer Ham with my camera. We were on the eighth floor of the Renaissance Hotel recently and the view of the Malacca River was quite stunning from where we were standing. There was no time for a cruise, which is highly recommended, by the way. We were on an overnight business trip to the historical city. I remember Sumita Martin raving about it when she was reporting for the New Straits Times from Malacca a few years ago. The river itself has an interesting history. 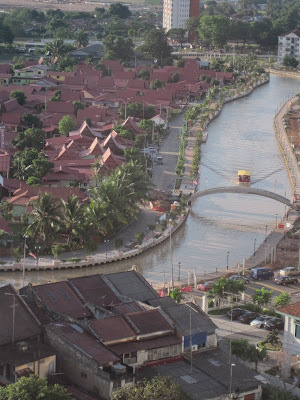 According to Melaka Malaysia Travel "throughout its history, the Malacca River slowly modified its role as a busy and productive port along the import trade route of spices to a popular tourism attraction". It was called the Venice of The East by European colonialists who were looking for new areas to acquire and keeping them dependent. A voyage by sea, stopping at various places and savouring local cultures ala Slow Boats To China has been my dream for as long as I can remember. For now, I would settle for a cruise around the Malacca River.